…you have to reach sometimes. Media Matters obtained audio of Sammon’s remarks by purchasing it through Hillsdale College. Yeah: They sold audio of the speeches made by Sammon and others during this cruise. And so it wasn’t exactly hush-hush. And of course, in context, you see that what Sammon is saying about this “Barack the Socialist” meme is that it was what everybody on Fox was discussing at the time, and he took part in those discussions despite whatever private doubts he might have had about the term. I can almost hear Joe Pesci saying: “I’m finished with this guy” after reading McCain, but hey Media Matters is paid to to find there there so there going to find there there even if there isn’t much of any. Of course if you aren’t paid to find it, then you’re Charles Johnson. Update: Actually Bill they don’t want people to listen to the tape, they only want them to repeat the headline. On Thursday, White House Press Secretary Robert Gibbs said that they were surprised by the applause at the memorial pep rally on Wednesday for the victims of the Tucson shootings. I will say that I read the speech several times and thought that there wouldn’t be a lot of applause if any. I think many of us thought that. But I think there was a celebration, again, of the lives of those who had been impacted. Not just at that grocery store but throughout the country. And I think that, if that is part of the healing process, then that’s a good thing. Then why was it printed on the Jumbotron? Some of Jim commentators suggest it was closed captioning. Assuming that is correct it seems to me odd that the “applause” tag would have been fed into the feed if the jumbotron was simply for the audience (who being there could see it without being told). Also since the remarks were prepared remarks it suggests that those applause markers would have been pre-programmed too. A bit tacky to say the least, but I don’t know for sure and a little digging from people there can establish the truth. I’m willing to give the admin the benefit of the doubt till then. Interesting note, do a bing search for “jim hoff” deleting posts and you get 39 results. Do the same with “Charles Johnson” instead of “Jim Hoff” and you get 89,100 results as of 5:07 p.m. today. That isn’t just projection, that’s a 12 screen multiplex with features offered in 3D. UPDATE: It would help if I spelled Jim’s name right. The corrected search is below. I’m certainly not inclined to take Mr. Johnson’s word concerning Mr. Hoft (who I met at Blogcon and had the pleasure of interviewing) when it comes to bad form by a blogger, but he is welcome to provide actual evidence to back the slander libel up. Till then it is just another case of Mr. Johnson signaling that he continues to need our prayers. Remember while there is life there is hope and no soul is worth abandoning. Plus I like happy endings. Update: It’s been pointed out that slander is spoken and libel is print, corrected to reflect that. Update: BIG correction I misspelled Jim name, the search should have been “Jim Hoft” redid the post with the right spelling and redid the search. Number of results is 3120 vs Johnson’s 89,100. My very big bad. Yesterday Charles Johnson was praising this far left crackpot for blaming conservatives for the Tuscon shootings. Today that same freak was arrested and charged with with threats and intimidation and disorderly conduct. UPDATE: Fuller will undergo a psychiatric evaluation. Charles is still on the loose. Mr. Fuller at least has an explanation for his actions having recently suffered the trauma of a gunshot wound. No word on what Mr. Johnson’s excuse is. …is Charles Johnson attacking those who don’t fall for this bunk. Well tomorrow is another year and to my knowledge he still hasn’t changed sides on Israel so there is still a slight hope for him, but I wouldn’t want to make book on when that will change. I guess Charles must have missed one. Stacy McCain notices what a difference 4 years has made in the mind of Charles Johnson. 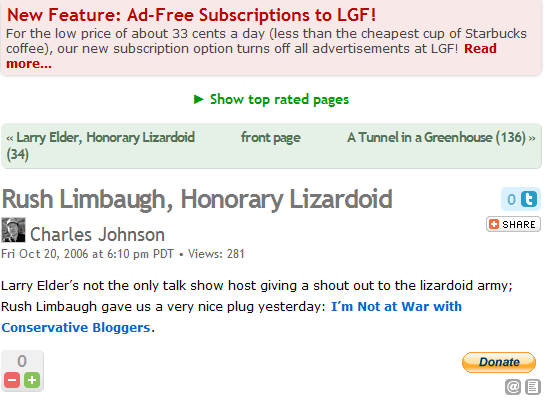 Yes Charles made Rush a Honary Lizardoid!